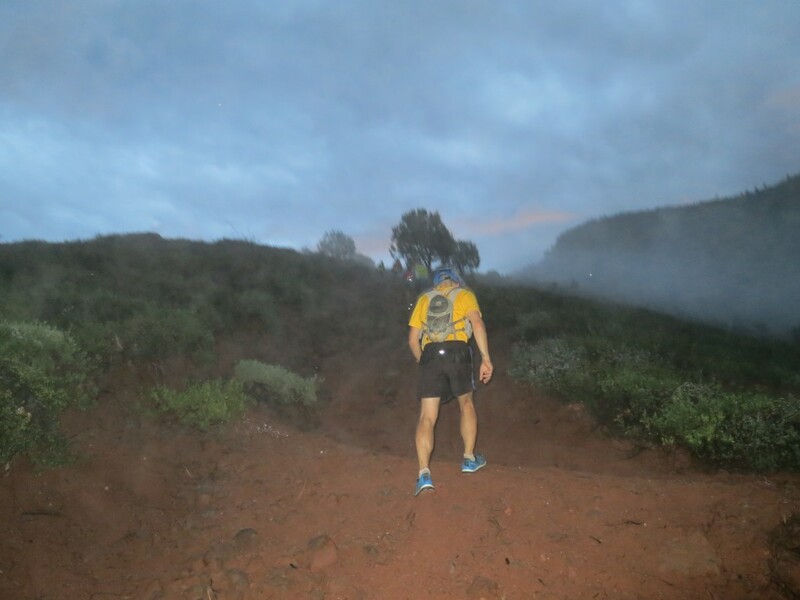 This Saturday I will attempt the Mogollon Monster race again. The race is 106 miles with 23,000ft of climb. My goal this year is 32 hours (35.5 hours last) but I’ll be happy with just finishing. 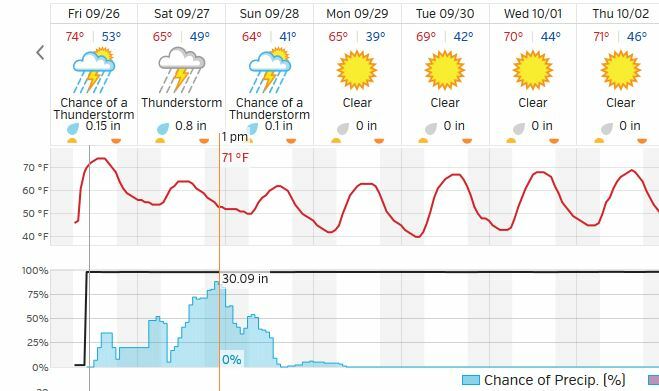 I am flying to Phoenix on Wednesday and spending a night in Flagstaff to give my body a chance to acclimatize to the higher altitude. 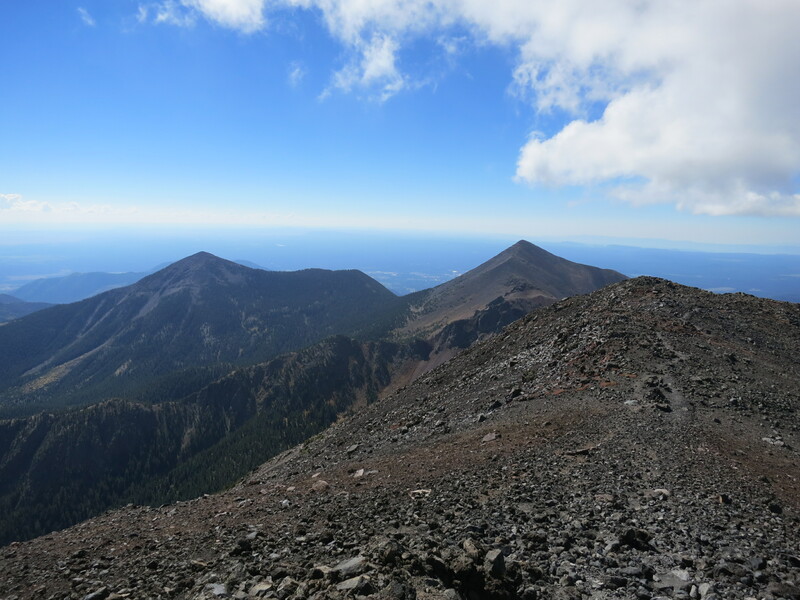 On Thursday, I may climb Mt Humphreys at a slow pace just to get more help with the altitude. It all depends on the amount of work calls I have during the day. 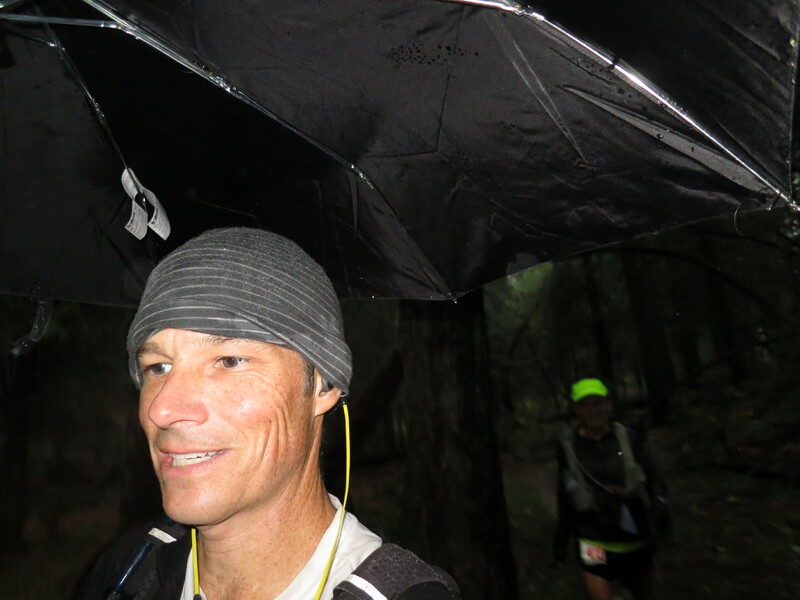 Friday is much of the same, but I’m moving closer to the start line by staying in Payson. Tracy won’t be there this year but I’ll have lots of support. Richard and Ryan are local Dell reps in Phoenix – they have agreed to pace me through 30 miles of the race. Also, my friend David who just moved to Phoenix will be driving up to cheer me on at the finish line. The race starts at 6am (PST) on Saturday and I hope to finish by 2pm (PST) on Sunday. This entry was posted in Mogollon Monster on September 23, 2014 by admin. Because I like stats, I loaded the tracking from my watch on to Strava. 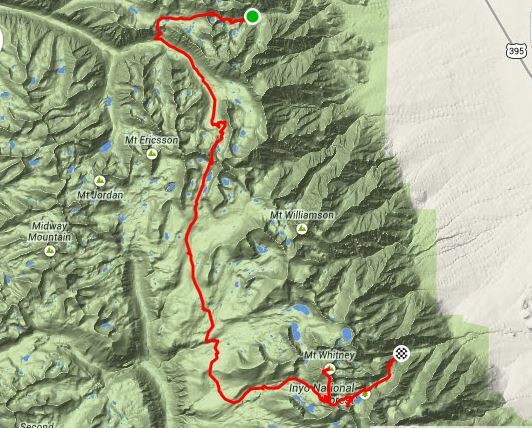 In total we did a total of 149.3 miles and 27.640ft of climb over 11 days of hiking. 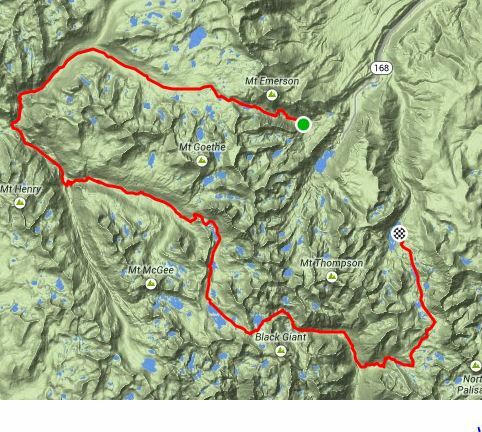 That is an average of 13.6 miles and 2,513ft of climb per day. This entry was posted in JMT Trip on September 13, 2014 by admin. 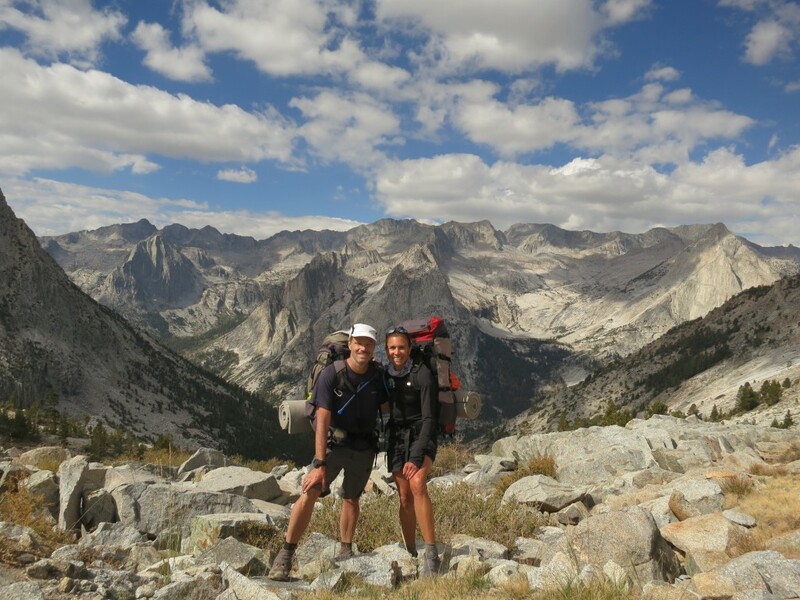 Our final segment of the JMT is over, and a little rough math indicates that we hiked close to 150 miles through the mountains. 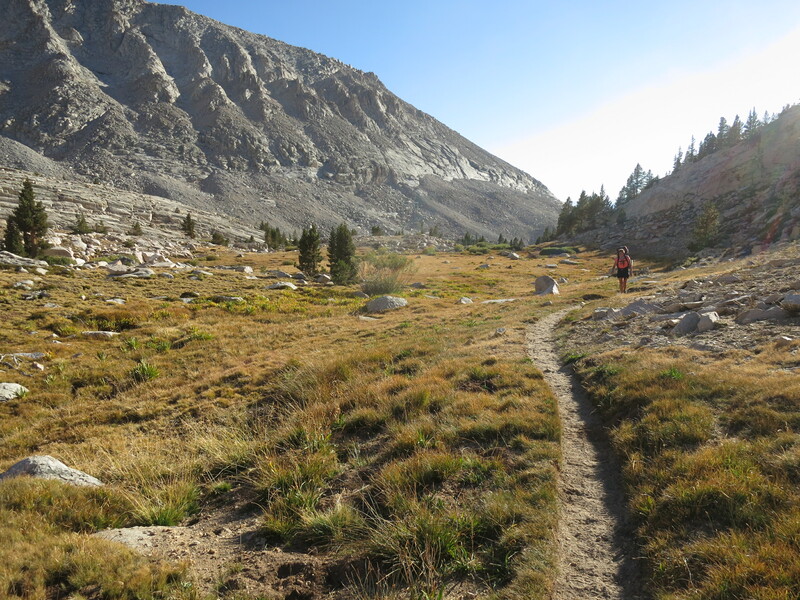 This last segment started at the Kearsarge Pass Trailhead, just west of Independence, California. 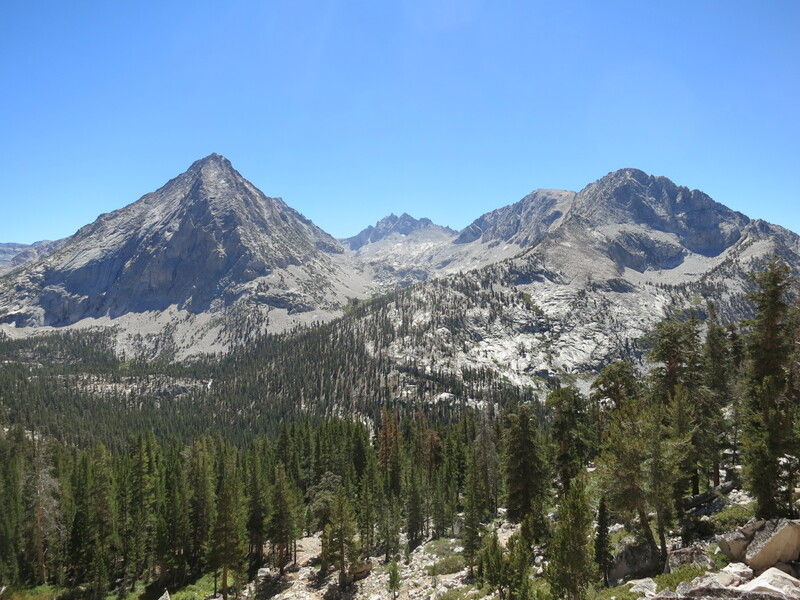 We hade met a hiker (hippie) on Bishop Pass and he had said he had just done Kearsarge and it was “butter” compared to Bishop Pass – he was right. The pass was well graded with very smooth trails. We climbed the 2,800 feet and 5 miles in 2 hours and 25 minutes. 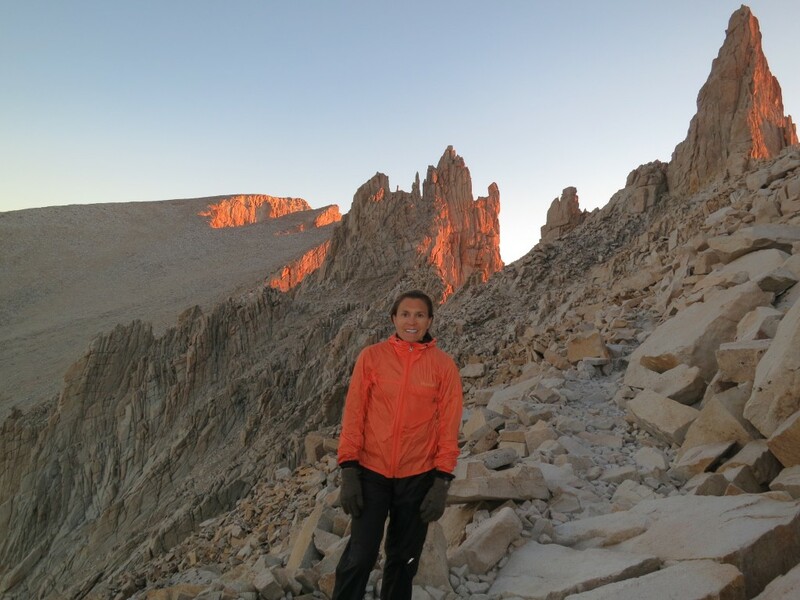 Below is a picture of Tracy on the crest. 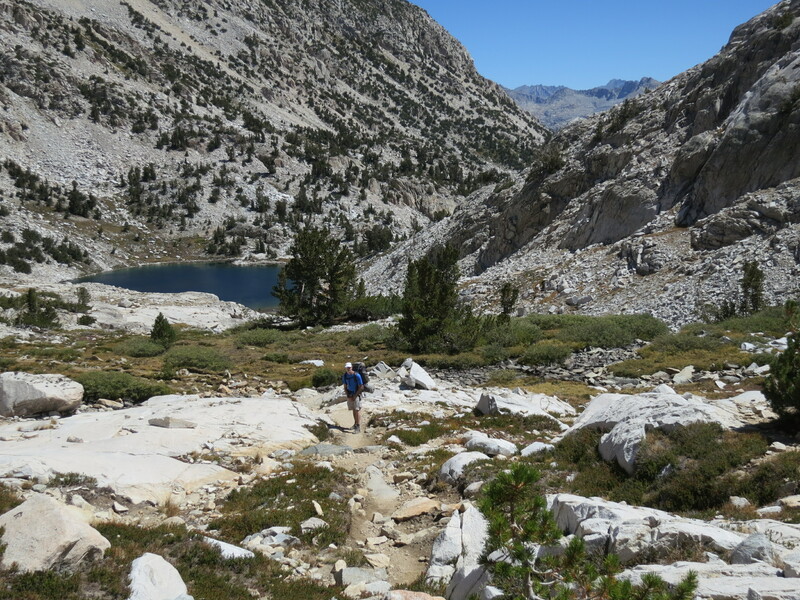 Once over the pass, we dropped into a small lake basin for a few miles, only then to descend 1,000 feet back to the JMT along the path of Bubbs Creek. 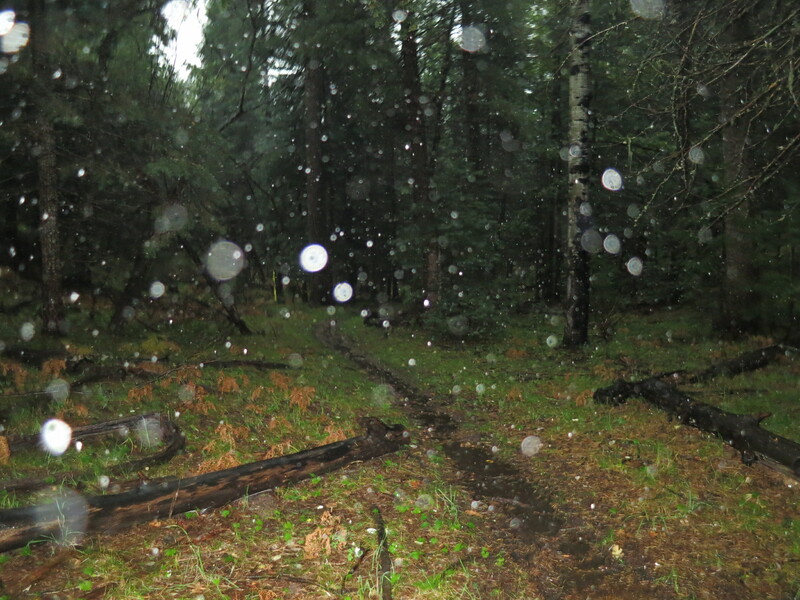 The trail follows Bubbs south for 7 miles until it hits Forester Pass. The valley is very sheer and is surrounded by 13,000-foot peaks. The picture below was taken at the top of the switchbacks above the creek. We climbed the trail until we hit the last large creek at close to 11,000ft and then we set up camp. We had hiked about 11 miles that day. The campsite was nice, but since we were in the woods and the peaks were so high, it got shady very early and that meant cold. We were in the tent before 7pm in our sleeping bags. It only got worse, we woke up around 4am, not able to stay warm in our sleeping bags. It was below freezing so I got the coffee brewing and we started to pack up for what was going to be the longest day of the trip. 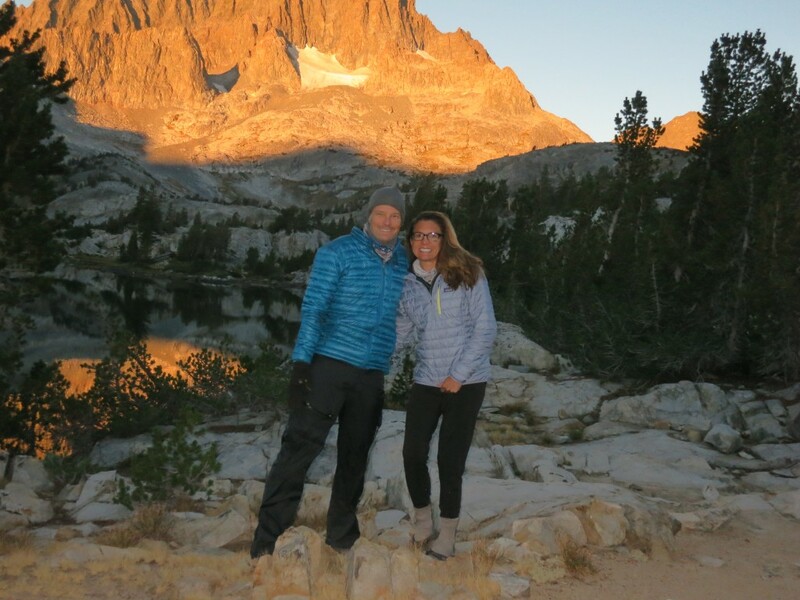 We were on the trail before sunrise and started the long climb up Forester Pass. 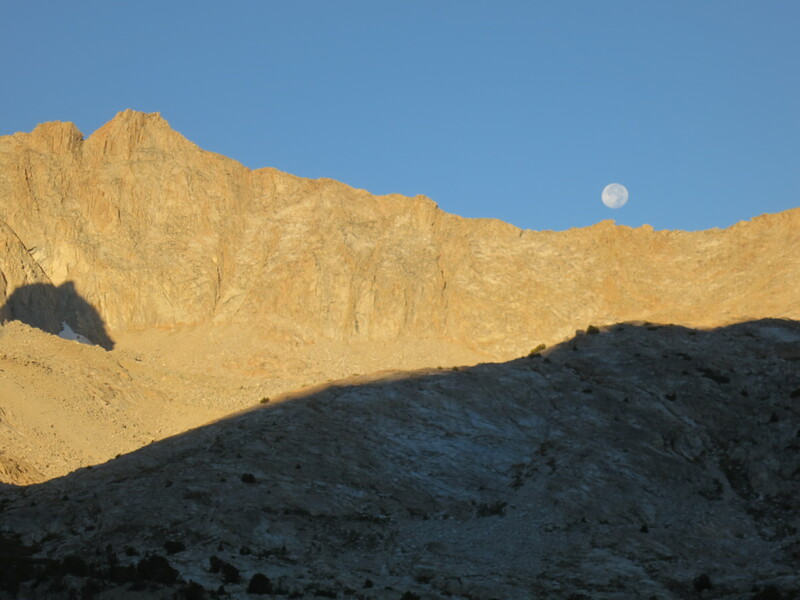 We had a great moon and the barren environment is very pretty when the rising sun strikes it. 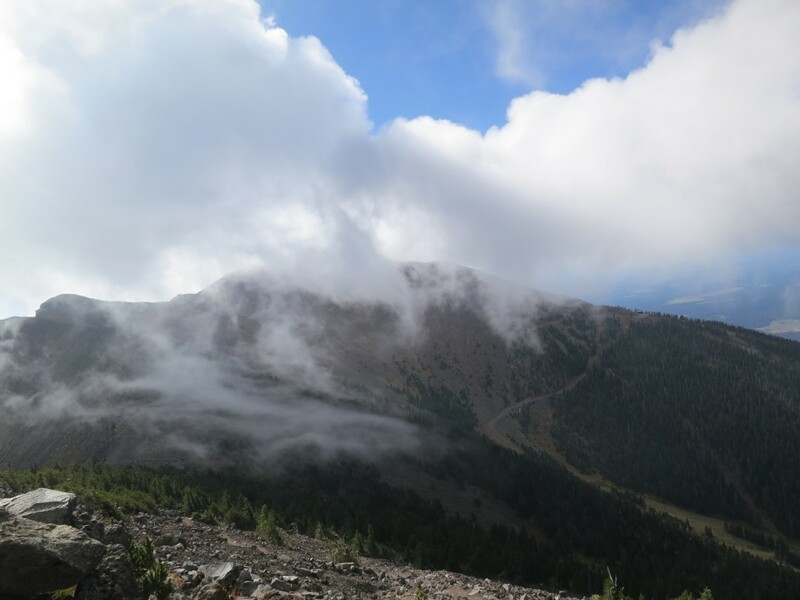 The pass is the highest on the trail, reaching 13,200 feet in elevation. The approach is very long and switches up a box canyon to a small slot on the saddle between two of the peaks. Once you crest the slot, the other side is a miracle of engineering. The trail is carved into the face of a sheer cliff. 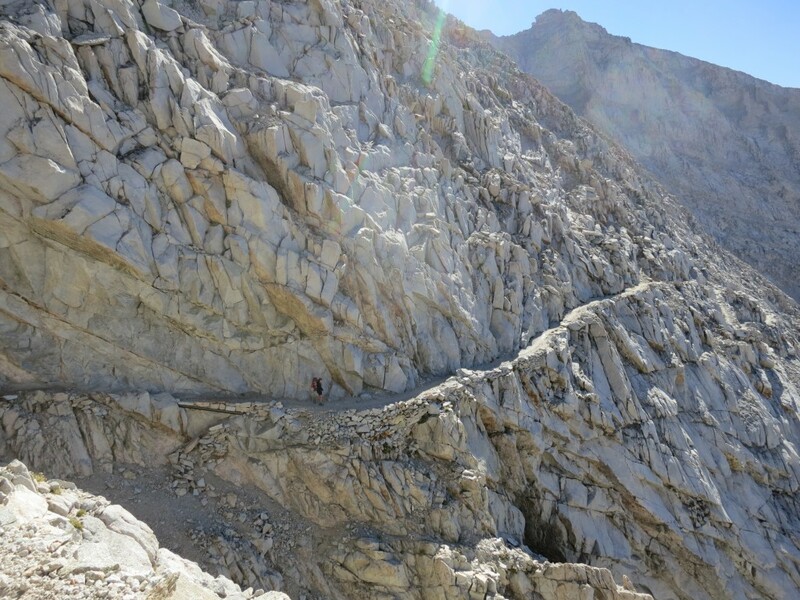 The pictures below show us on the top of the pass, plus a picture of Tracy descending the 5-foot wide carved trail on the other side. After the pass, the grind started. Our goal was to reach Guitar Lake, which is the last camping spot before Mt. Whitney. The bad news was that it would require a 20+ mile hike with a ton of elevation change. 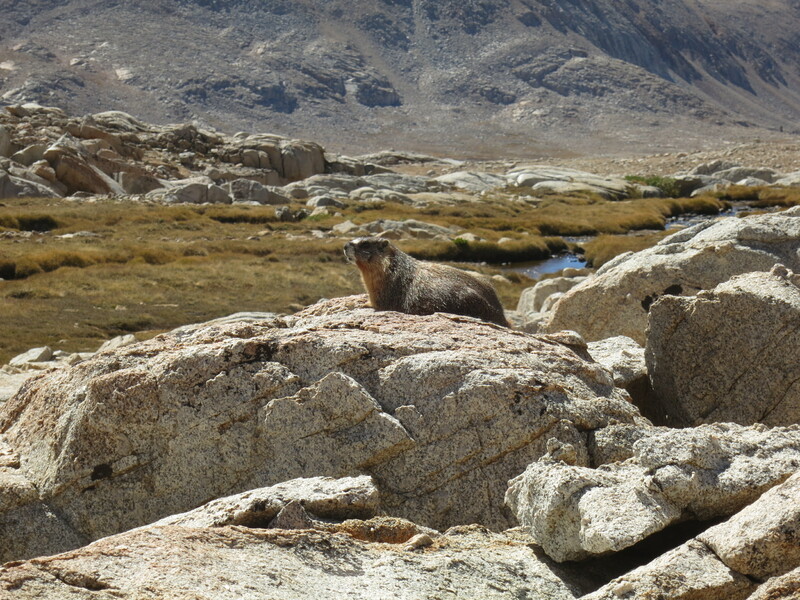 One of the ways we passed time was to look for marmots. 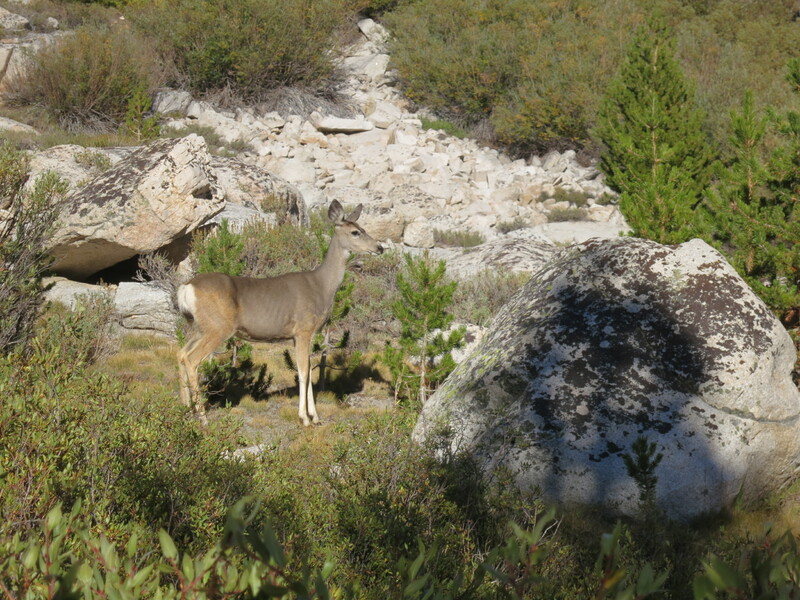 These fat, furry creatures live in the rocky barren areas of the high basins. They dig elaborate tunnel systems below the rocks, but most often are seen sunning themselves perched on boulders. They make a chirping sound that caused us to constantly play the “find the marmot” game. We also saw a lot of deer. They were usually in pairs and would appear on or around the trail in front of us. They don’t feel threatened by humans but are still frightened if you get too close. 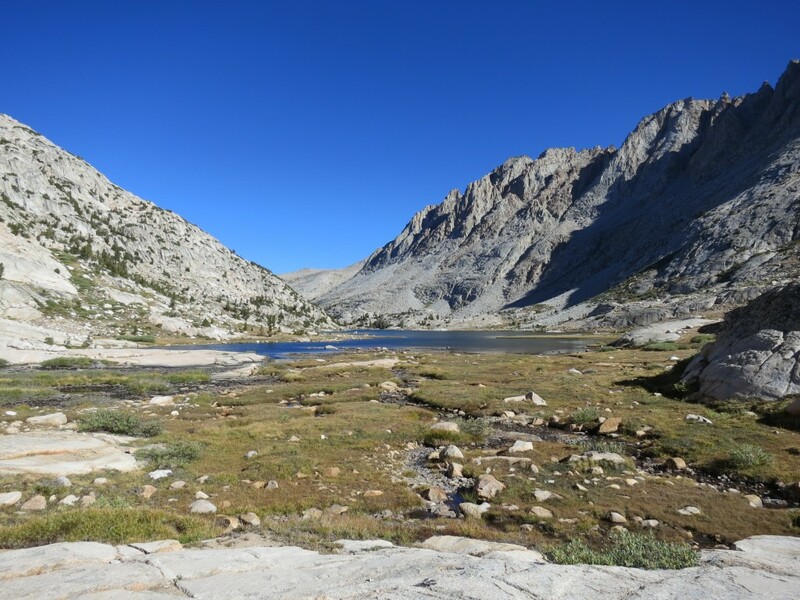 The last section of the hike required us to turn east and climb into the Whitney Lake basin. It was late in the afternoon and both of us were exhausted. 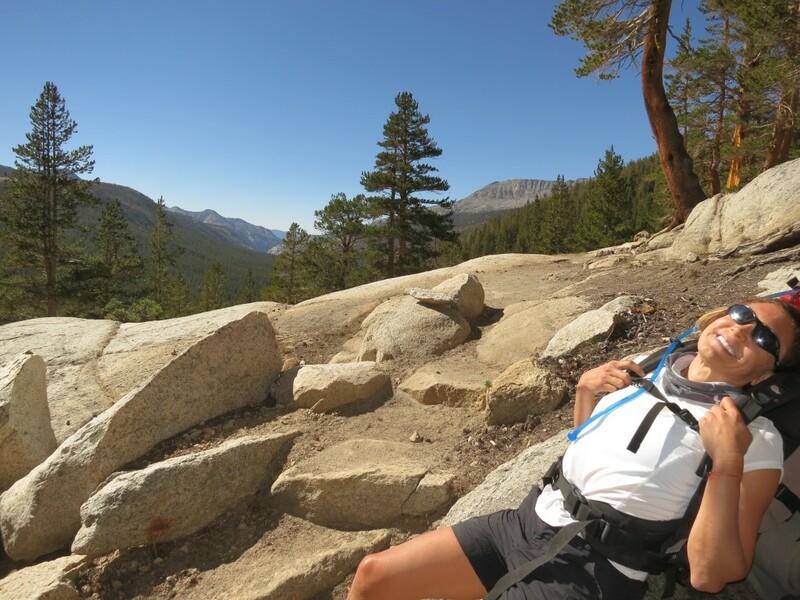 The picture below shows Tracy after the final climb of 1,600 feet to Guitar Lake. We ended up climbing almost 5,000 feet over 21 miles on this day. Guitar Lake has lots of camping restrictions in place to make sure that the last water source prior to Whitney is not polluted by the mass of people that camp there. It was close to 6pm when we pulled in so we got the slim pickings from what was left, which was a lumpy piece of sand about 100 feet from the trail. Tracy went to soak her legs by standing in the icy lake, and I got water (no picture this time). By the time we got camp set up, the sun had set so we cooked dinner in the vestibule of the tent. We set the alarm for 3am so we could summit close to sunrise. The morning came fast and we were packed up and climbing by a little after 4am. The trail ascended 2,200ft to the intersection of the crest trail (the one that takes you down the other side) and the Mt. 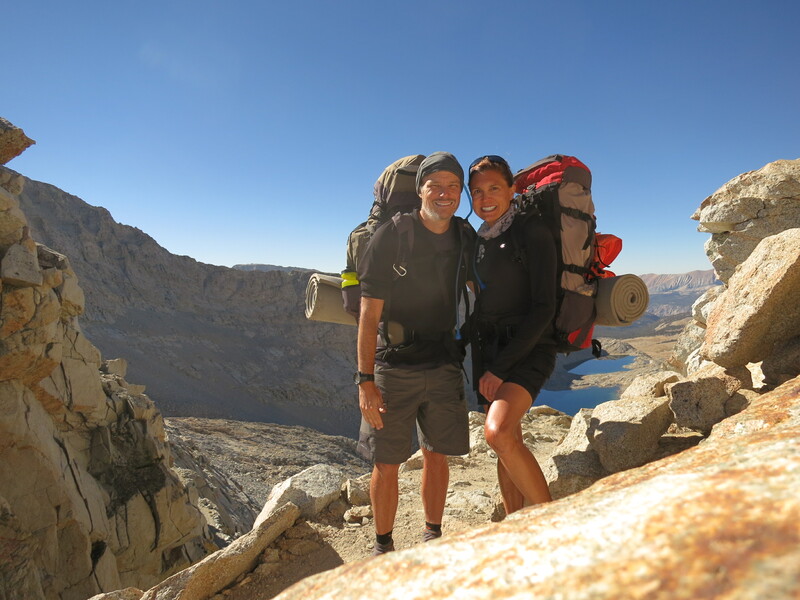 Whitney summit trail. The intersection is called “pack rest” since the last two miles of the summit trail is an out-and-back, so we were able to leave our packs here and climb to the summit. The sun was just rising so the colors were striking coming through the pinnacles along the trail. The actual summit is the far plateau above Tracy’s head in the picture below. We made the summit before 7:30am. 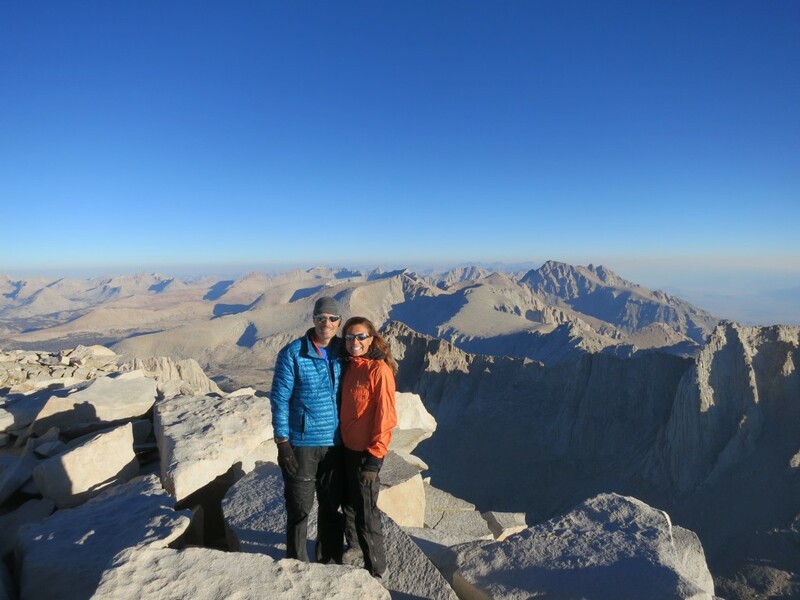 There were a few people already there, including a group that had just completed the JMT. They took the picture below of us. 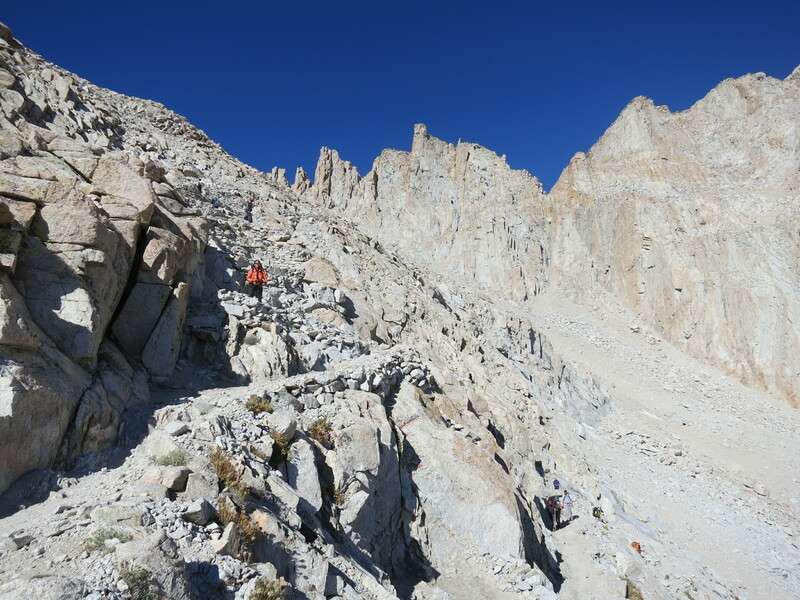 Getting to the top is only half the effort – the descent from Whitney is straining on the body. 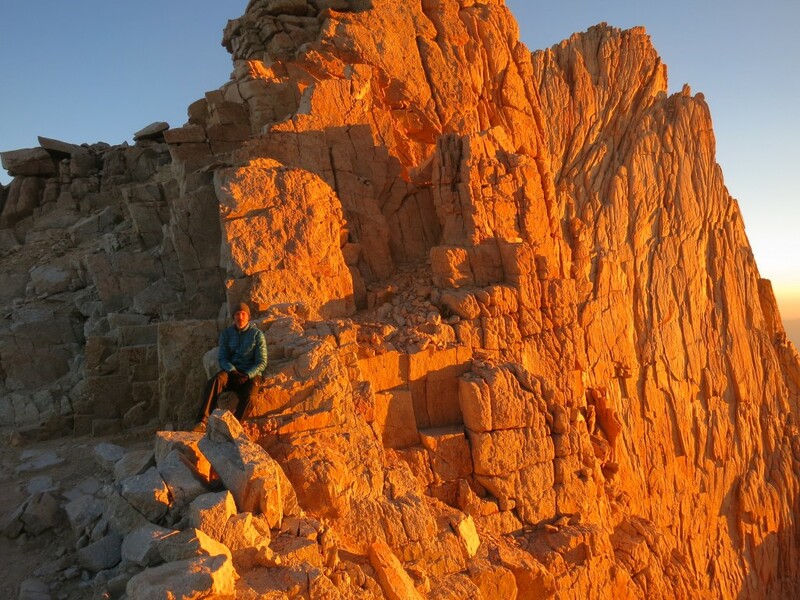 It requires over 10 miles of down-dropping more 6,000ft to the Whitney Portal. 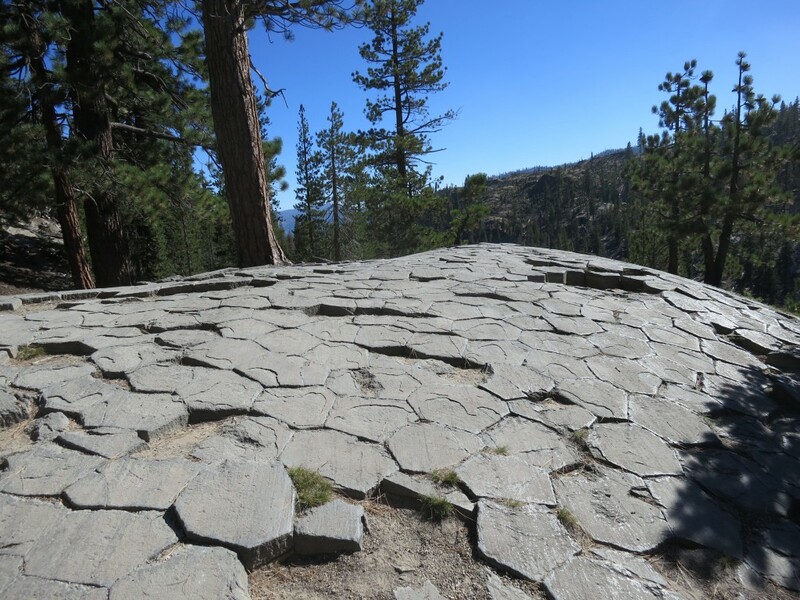 The drop is through multiple lake basins that contain countless switchbacks. After many hours of knee jarring steps, we made it. We had beer and champagne at the store to celebrate our successful trip, and Tracy made a sign so we could hitch a ride to Lone Pine where we had reservations at a hotel for the night. The plan today is to catch the bus to Lancaster, CA., rent a car to Burbank, and then fly home. If all goes well, we will be in our own bed by midnight. 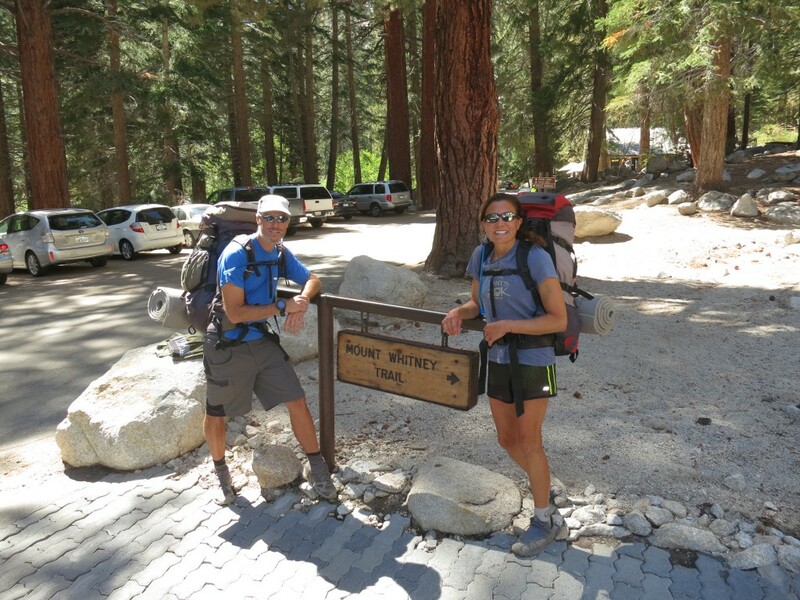 This entry was posted in JMT Trip on September 12, 2014 by admin. We made it through the 2nd segment and are currently in Independence, CA at the Mt Williamson Motel. The motel is owned by Doug and Strider, who are incredible hosts who specialize in backpackers. We got off the trail at just the right time since the picture below is from about an hour ago. It’s the first rain they have had in two weeks and it happened on the day we came off of the trail. 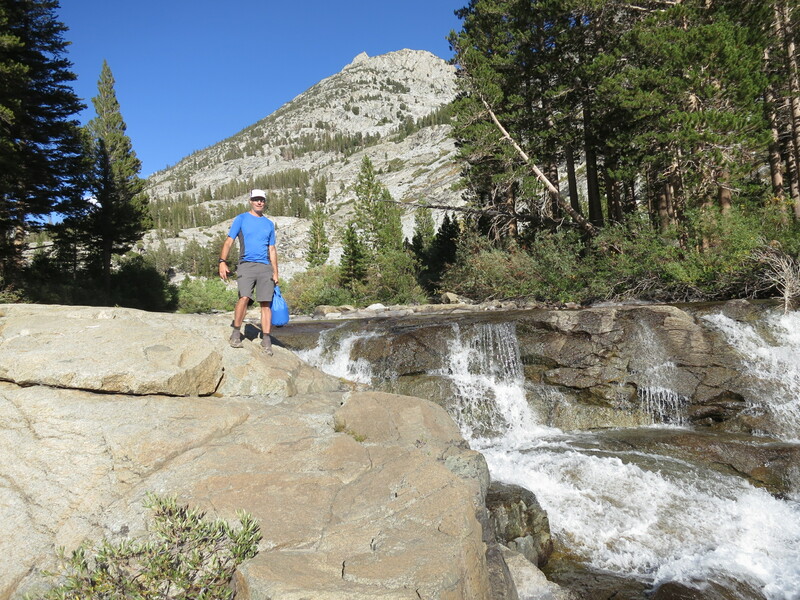 Our second segment began with our being dropped off at North Lake Trailhead to start a trail that would take us over Piute Pass (11,423ft) to the Humphreys Basin. The pass was well graded and we made great time climbing the 2,200 feet from the trailhead. The basin on the other side was flat and open and looked like a desolate wasteland. We followed the trail until it divided in a way that wasn’t on our map. We choose the southern trail since that is where the horse tracks went. Unfortunately this turned out to be not the quickest path. After a couple hours of following a trail that seemed to disappear and reappear but was heading in the right general direction, we came to the intersection of the primary trail. We picked up the pace and hit the place we intended to camp (12 miles in) with a lot of time left in the day. 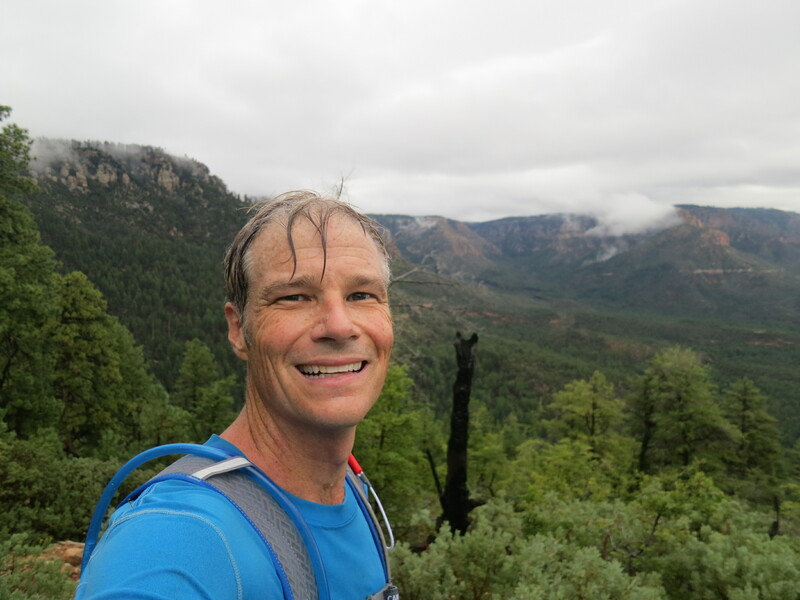 So we decided to keep going, which involved a 6 mile, 2,000-foot descent through Piute Canyon. Since the canyon is sheer, we thought we’d need to go all the way to the bottom to find a place to camp, but after about 3 miles we came across a great site right next to a waterfall. Tracy makes it a point to take a picture of me every time I haul water, and here is that picture from this campsite. The next morning we got moving early since we knew we had a long day ahead and we wanted to reach Evolution Lake. 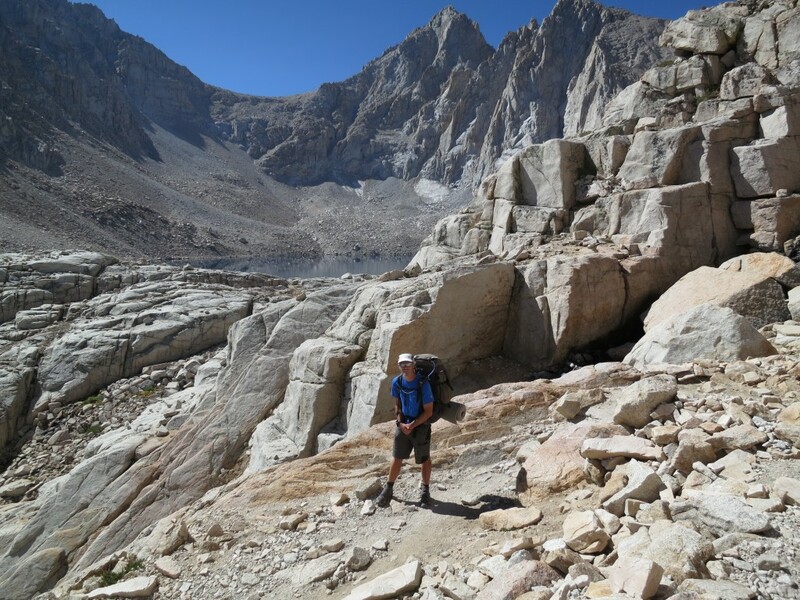 Our goal was to continue down Piute Canyon, connect with the JMT and turn East into Evolution Canyon and then climb into Evolution Basin. This section of the trail I consider the most spectacular of the entire JMT. It involved our climbing 2,800 feet through an incredible canyon system. 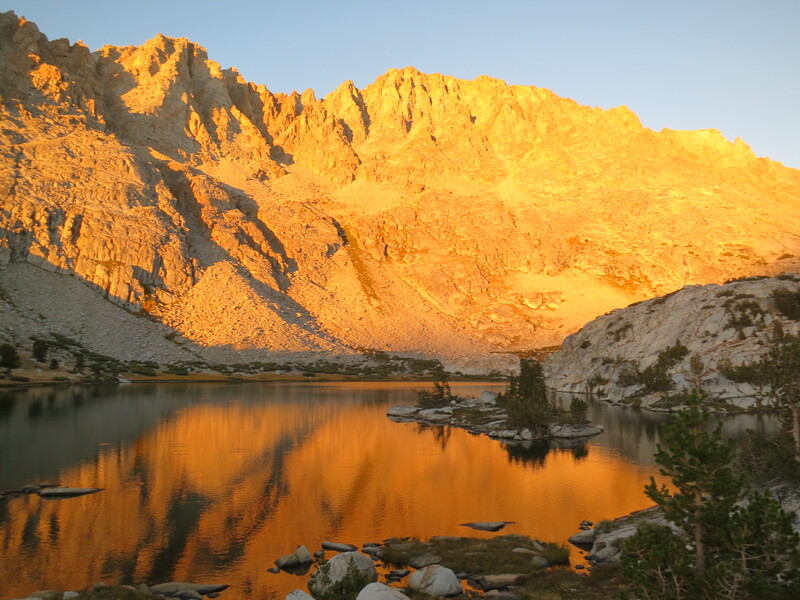 The place I wanted to camp was right on Evolution Lake, which is surrounded by rugged peaks. We put in over 16 tiring miles through a series of ups and downs. 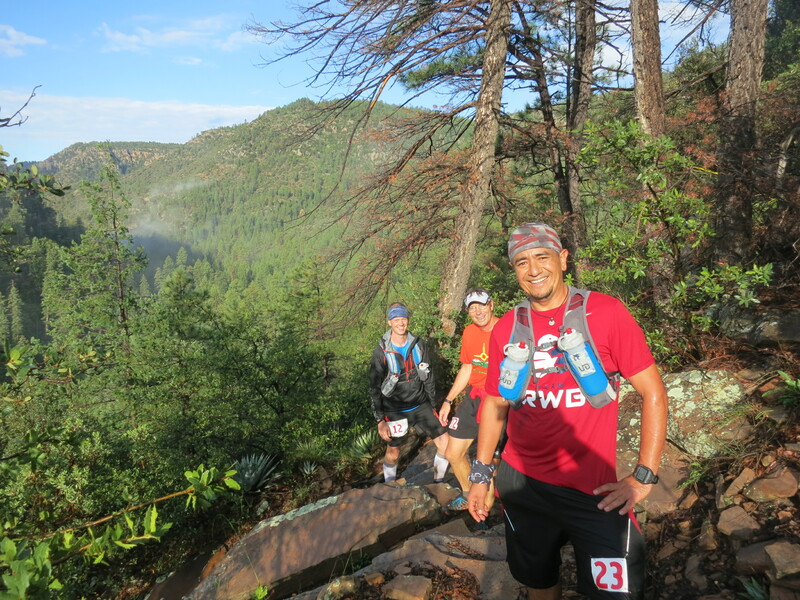 The canyon consists of a lot of bowls that contain lakes so a vertical elevation change of 2,800 feet really entailed out climbing over 4,000 feet with all of the climbs and descents. There were many places where we both could find a perfectly sized rock to rest on–just like the one Tracy is on above. It gets really cold once the sun goes down so we are often in the tent and ready for bed before the light of day has faded. That also means that we are up at sun up. I made sure I was out of the tent and ready for the first light on the mountains. The picture below is from the outlet that lead to a 1,000-foot drop over the valley. The view from the cliff was incredible. Up at 6am, coffee and breakfast by 7am, and packed and ready to go around 8am. It always made it easier to start hiking after the sun would warm everything, Below is the final picture before we left this magical spot. Our hike that day consisted of climbing the remainder of the Evolution Basin over Muir pass (11,955ft) down through Le Conte Canyon to a campsite next to Little Pete’s meadow. The climb wasn’t terrible, but the drop on the other side was close to 3,000 feet, which is exceptionally hard on the body while carrying a full pack. 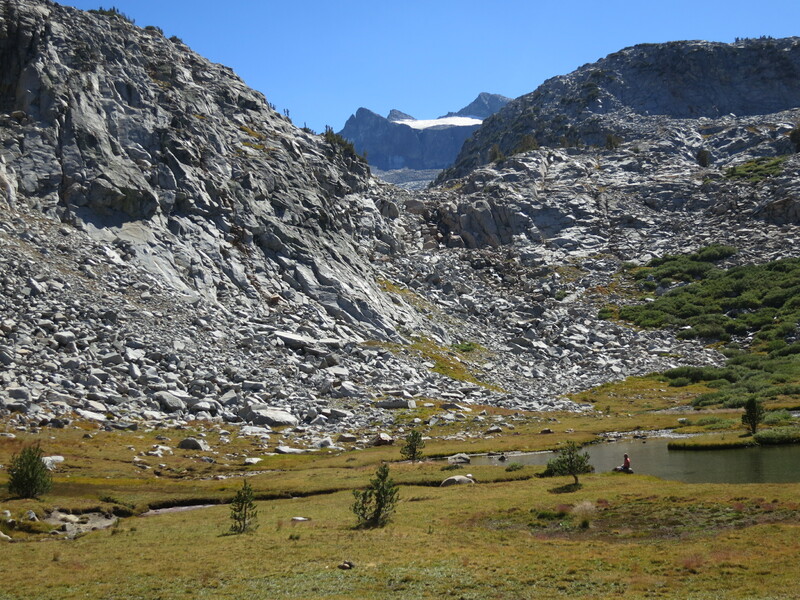 The pictures below show the lakes on both sides of Muir pass. It’s amazing how many lakes there are as you climb higher and higher into the mountains. 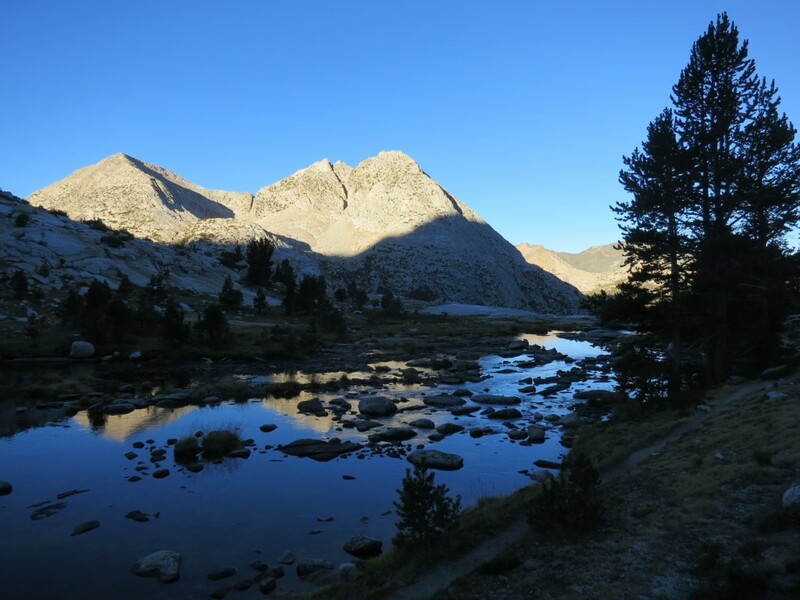 The bright blue waters contrast the moonscape environment that exists above tree line. The fascinating thing is these lakes have a lot of life around them- frogs, fish, and even ducks live in them. 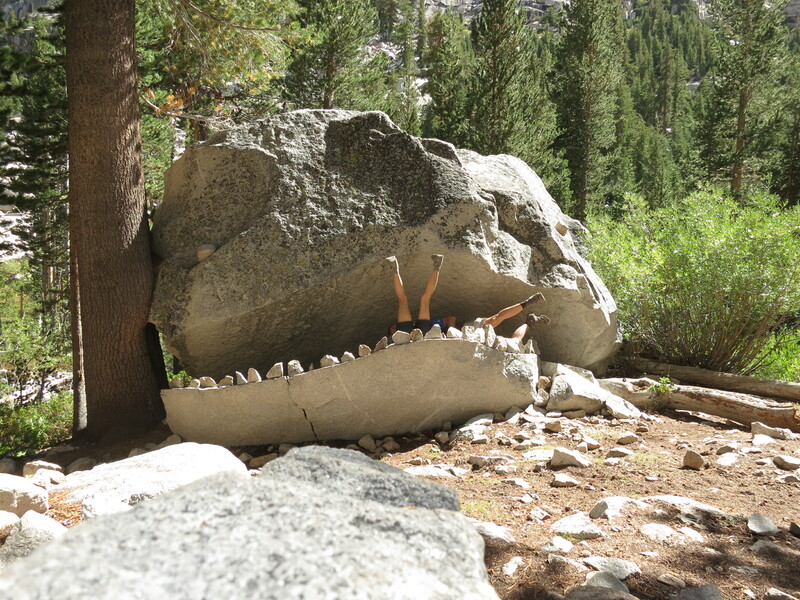 We see a lot of wildlife on the JMT, but none more stunning than the JMT monster who is often seen near Little Pete’s meadow. Tracy and I barely got away as he had us both by the heads. Only our furious kicking allowed us to escape his bite. In all seriousness, we took this picture on a 10 second timer, which involved Tracy holding herself upside down while I pushed the button, ran and dove into the rocks without knocking over any of the teeth. 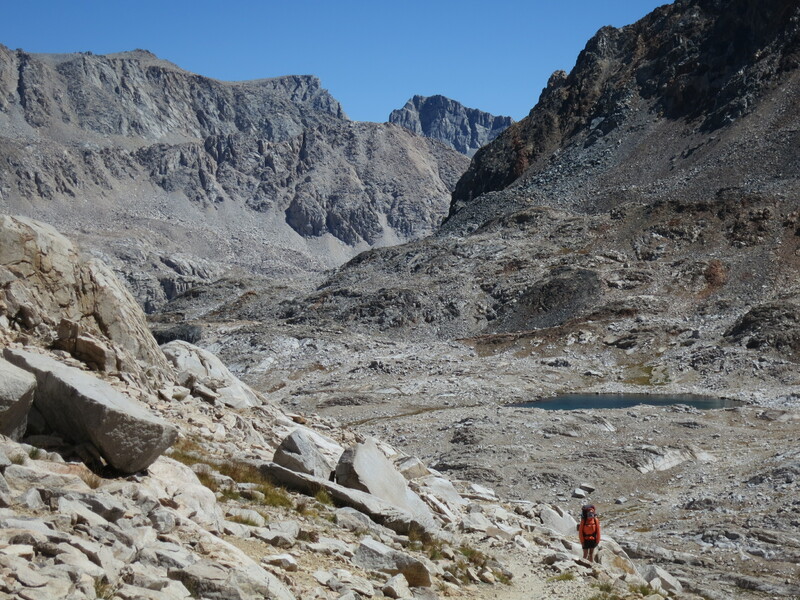 Our last day on this segment required us to drop to 8,600 feet and then turn east on the Bishop Pass Trail for 13 miles to the South Lake trailhead, where our ride (Doug from the Mt. Williamson Motel) was going to be picking us up at 5pm. Compared to the days we’d been putting in, this sounds easy, but when looking at the elevation profile, we knew it wasn’t going to be. 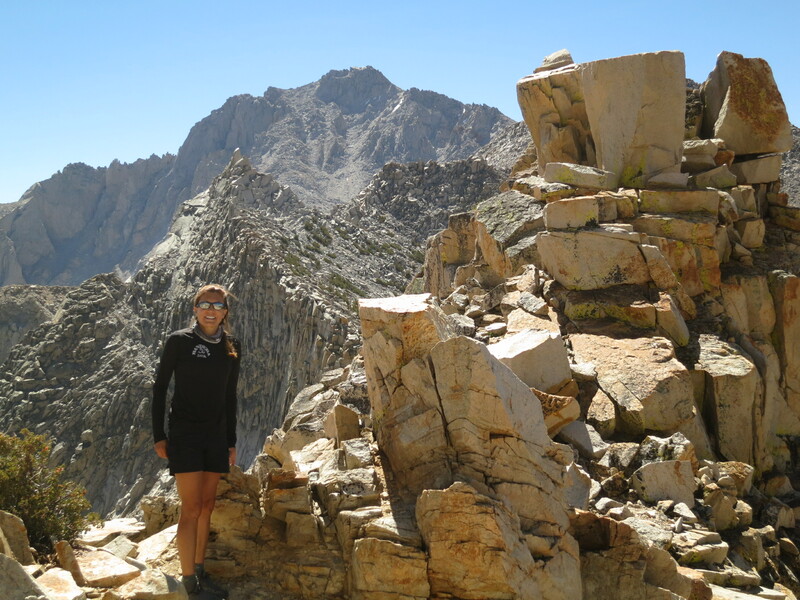 I’d never been on the Bishop Pass Trail, but it involved climbing over 3,300 feet to 11,980ft, the elevation of Bishop Pass. The trail started with an immediate 900-foot climb up to a basin that was similar to a box canyon. The trail followed a beautiful creek that cascaded down slick rocks to the river below. Once in the canyon, we flattened out for a mile only to switchback up the back wall of the box canyon. At the top, the view was breathtaking. This canyon running perpendicular to us is the picture below is Le Conte canyon, where we had camped the previous night. We were already 2,000 feet above it after only 3 miles on the trail. The next section of the trail went through Dusy Basin. The basin is a cross between a high mountain wasteland and that of an old western movie. Lots of small trees, lakes, and rolling hills that are surrounded by jagged peaks. It was scenic in a way that we hadn’t experienced yet on this trip. Only the last mile turned into the barren landscape we would expect on a high pass. 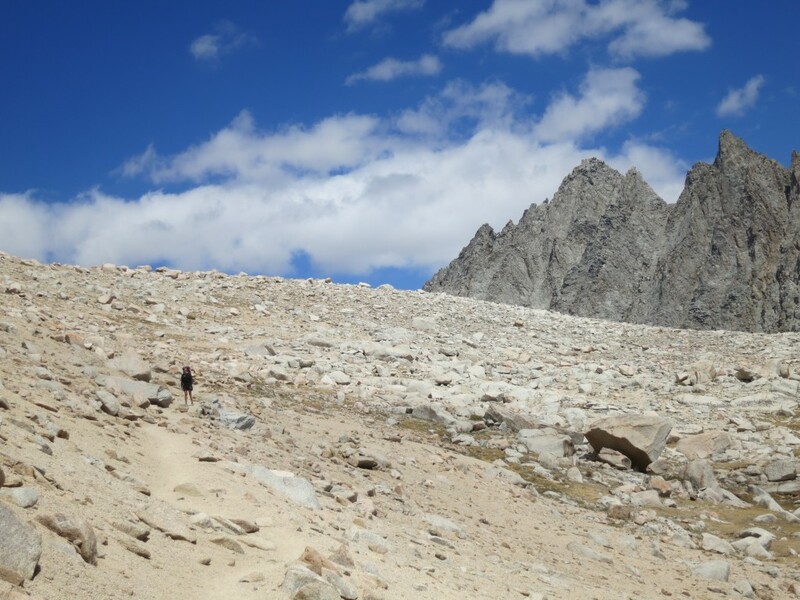 The picture below is Tracy in the distance making the final climb across Bishop pass. The other side of the pass required a lot of switchbacks through a boulder field followed by lake after lake as we descended the final 6 miles. We ended up at the trailhead at 3:45pm. Our ride came promptly at 5pm and drove us an hour to the motel. We can’t recommend the Mt Williamson Motel enough, even while writing this, we paused for a homemade breakfast in their bunk house. Doug and Strider run a great place with incredible service. 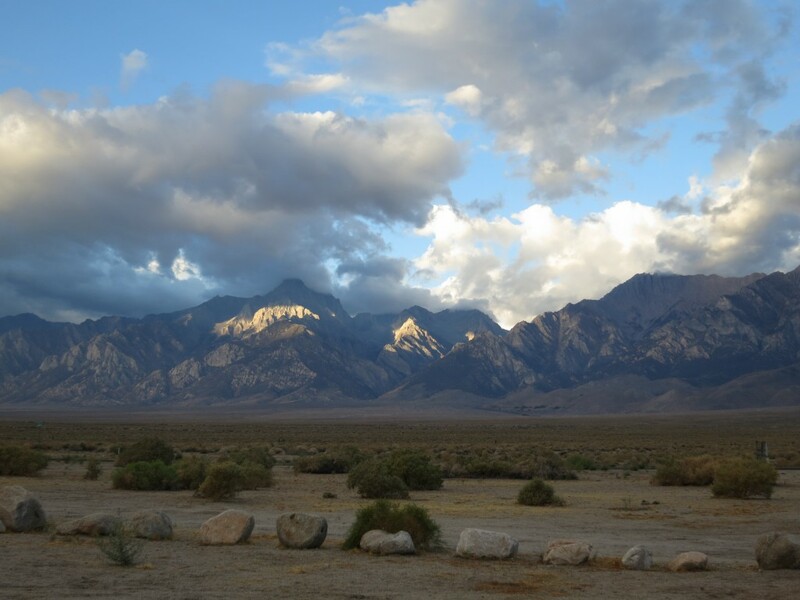 This entry was posted in JMT Trip on September 8, 2014 by admin. We made it back to Mammoth last night around 8pm. After a quick dinner, we crashed into the soft bed and slept deeply. We get a zero day at the Tamarack Lodge to resupply food, relax our bodies, and eat some fresh food. Over the past 4 days, we covered almost 50 miles and saw some wonderful country. On Saturday we were dropped at Tuolumne Meadows in the morning. We picked up our permit at the ranger station, registered at the campground, and set up our camp. Since it was still early we decided to do an out and back to Cathedral Lakes. 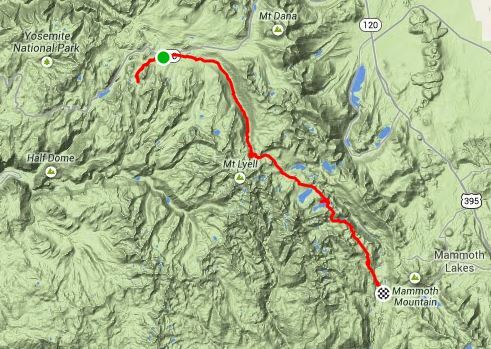 The round trip required a 1,000ft climb and about 11 miles of hiking. 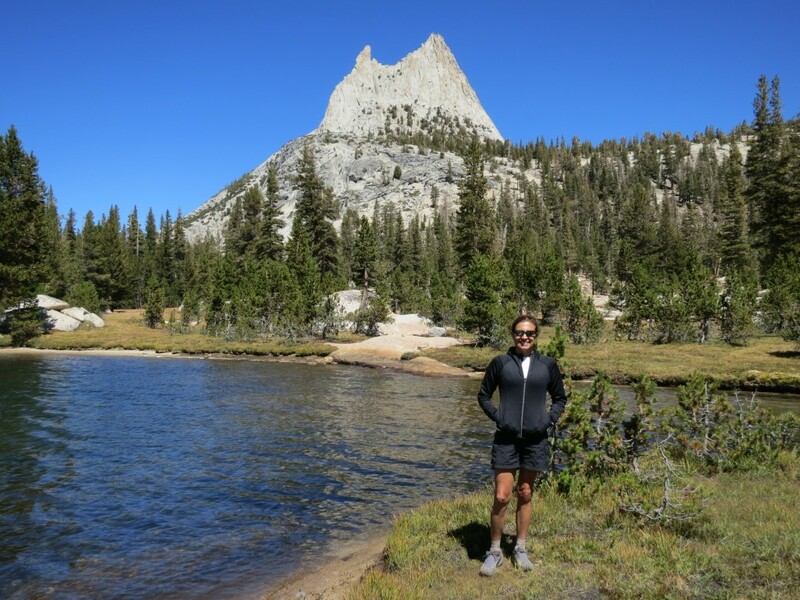 The picture below is Tracy beside the lake and below Cathedral Peak. We returned to the Meadows and grabbed lunch at the café there. The rest of the evening was spent getting our gear ready for the following day. We set out the following morning by following the Lyell River up the canyon for 8 miles. We then starting climbing towards its headwaters in the mountains. The climb would eventually end at Donohue Pass but we weren’t planning on tackling that until the following day. We ended up stopping at a mountain lake after 12 miles and an 1,800ft climb. We camped a little above the lake, but spent several hours cleaning clothes and our bodies in the water. If you look closely at the picture below, you can see Tracy sitting on a rock in the water. This was the view from our campsite. The following day we had to summit the pass which is slightly over 11,000ft. The weather was perfect but Tracy’s hip was hurting her so we took it easy and made it to the top by 10am. The picture below is of me climbing to the pass. The valley and campsite from the night before are in the background. We then had many miles of down hill which taxed Tracy’s hip even further. After a break at Rush creek we started to climb Island pass, which is a lot smaller than the last but still required 800ft of climbing. The trail then wound around Thousand Islands Lake which is incredibly beautiful, but I had a specific place to camp in mind which was still further. Leaving that lake we climbed to the next and the next. 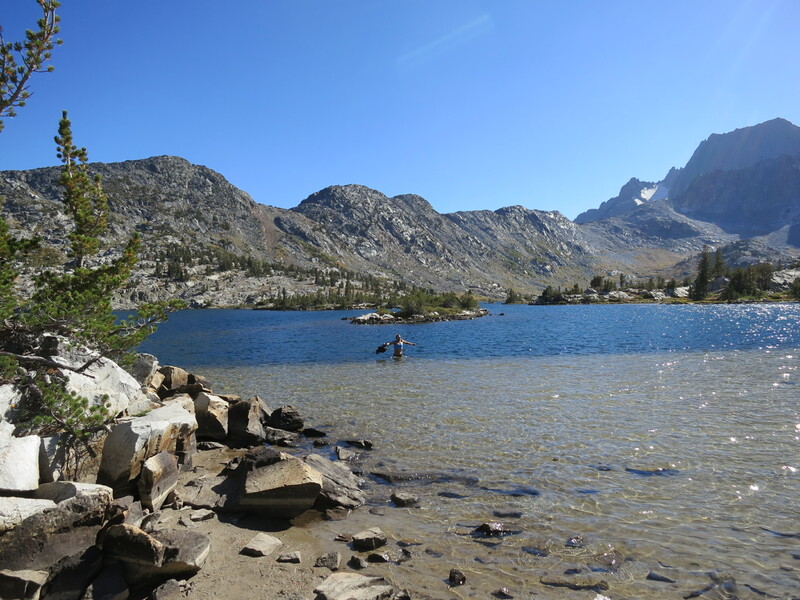 It seems in the Sierras that every lake is in a bowl so getting to a lake always requires a climb and a descent. We seem to do this over and over again. We finally got to the lake that I wanted to camp at but it required going off trail for half a mile at a very steep decent of 300ft that we’d need to climb in the morning. Once we got there, we had a private beach, incredible views, and complete solitude (with the exception of the bear tracks in the sand). The picture below is from sunrise, but this was the view from our tent. 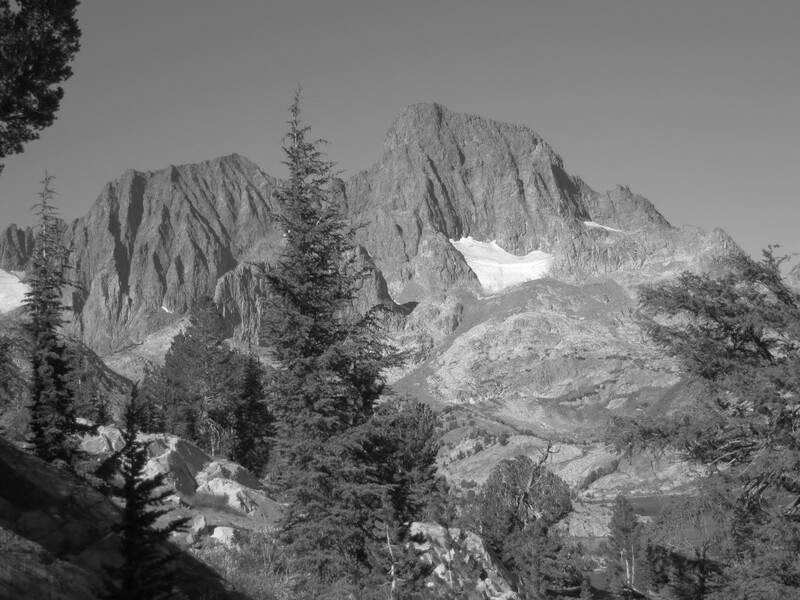 You may recognize the peaks better if they are in black and white. 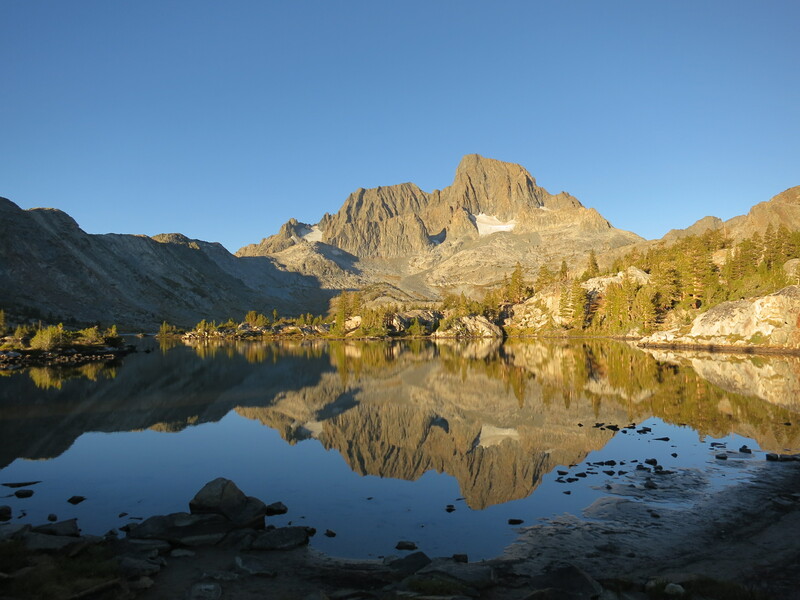 The area we are in is the Ansel Adams Wilderness, since it was the location of so many of his famous photos. We had a great afternoon lounging on the beach. When backpacking there isn’t a ton of spare time since you often hike until late in the afternoon (4pm this day) and if you want to dry anything you need to get it into the sun immediately. We got the tent set up, filtered water, and starting washing the massive amount of dust from the trail off our clothes. Since we had a great sandy beach we also decided to do the same of our bodies. Take a look at Tracy submerging herself in a lake that is fed by the glaciers above. Between the two of us, we must have taken a hundred pictures of this lake and the peaks around it. I got up before sunrise to make sure I got every possible angle of the sun. Tracy was a trooper to get up also so we could get a timed shot once the top of the mountain was lit by the rising sun. It was tough leaving that campsite but we were on the trail by 8:20am and that was even after breakfast and Tracy making a short video for her work. 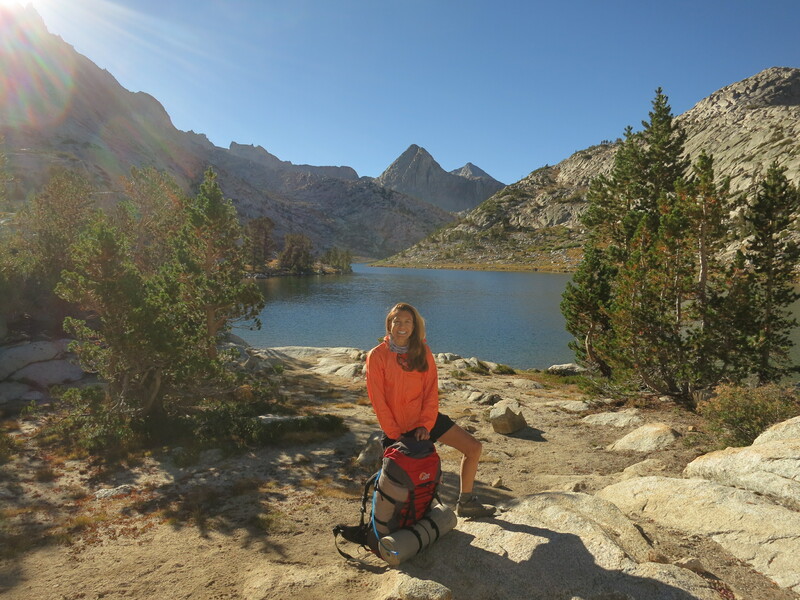 The day required us to hike over 14 miles through multiple lake basins (which means climbing) and to traverse a hot and dry 5 miles down a dusty slope. The good news was the destination of Red’s Meadows had showers, food, and laundry. We were moving at a decent pace until Tracy kicked it into high gear and we covered the dusty part twice as fast as I expected. I know she was hurting, but we were both happy to have that part done. Along the trail, you meet a lot of people. One of the most interesting was Glenn from Washington. He was taking a break right after climbing out of the Garnett Lake basin. We talked with him for some time. 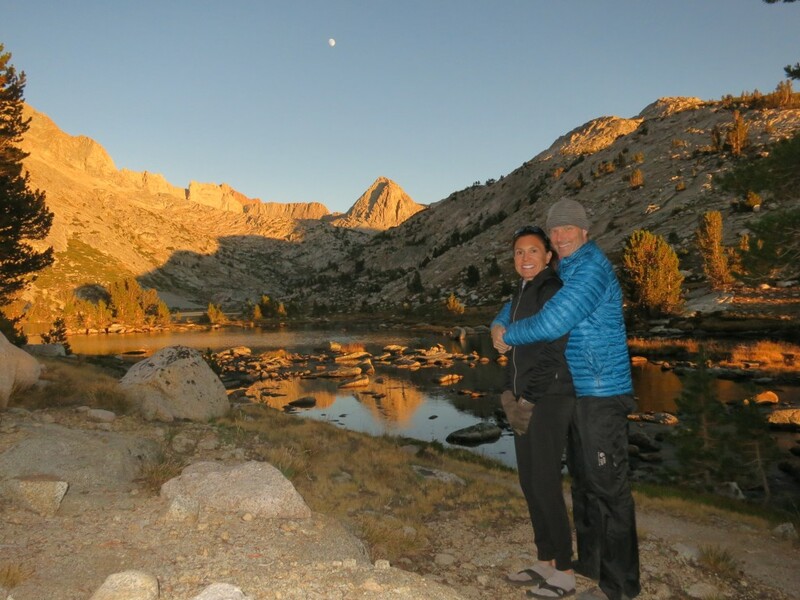 He was hiking the entire JMT. 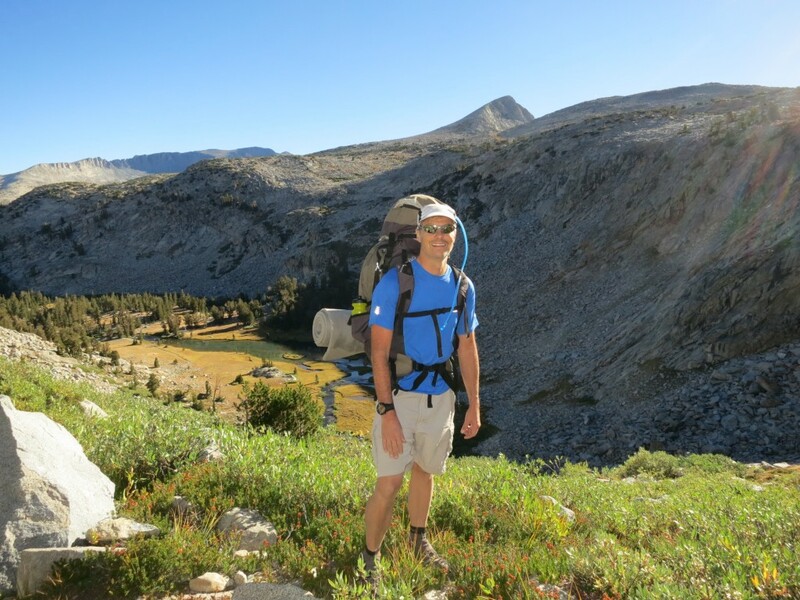 He was an older guy and you could tell by his pack and his large physical build that he wasn’t a rookie backpacker. He told us that he hiked 1500 miles on the PCT last year covering the states of Oregon and Washington. Then he told us the thing that floored us, he was 73 years old. It was really hard to believe since he was in better shape than me and had no inhibitions about hiking solo in such remote places. From the 20 minutes we spent with him we could tell that there were years of stories he could tell. On the way to Red’s we cut through Devil’s Postpile National Monument. The name is so fitting (see the picture). 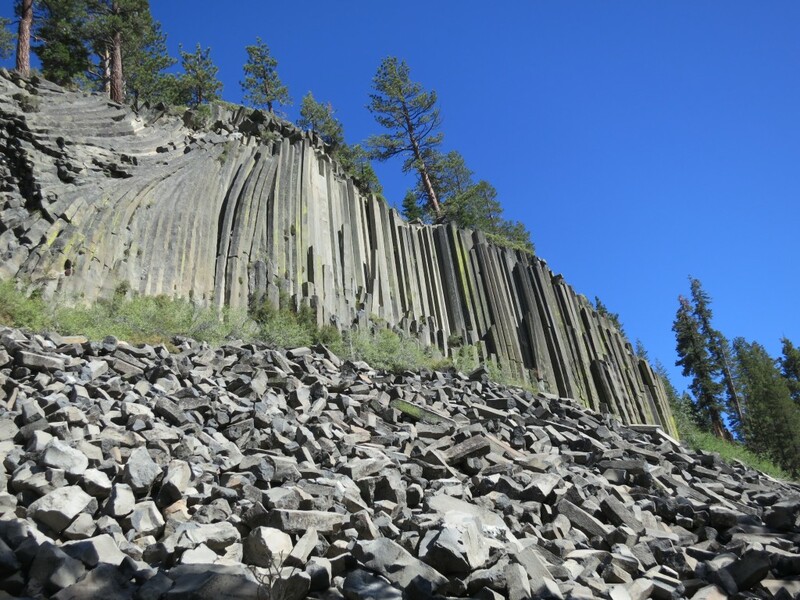 The posts are formed by lava cooling into a honeycomb shape vertically. The honeycomb is due to the fact it’s the strongest shape. The posts are revealed once erosion happens and the full vertical post can be seen. We walked up to the top and you can see the tops of the posts that are still buried. This is just a small section of the tops, but up and down the hillside they were everywhere. It was almost like nature’s tile floor. 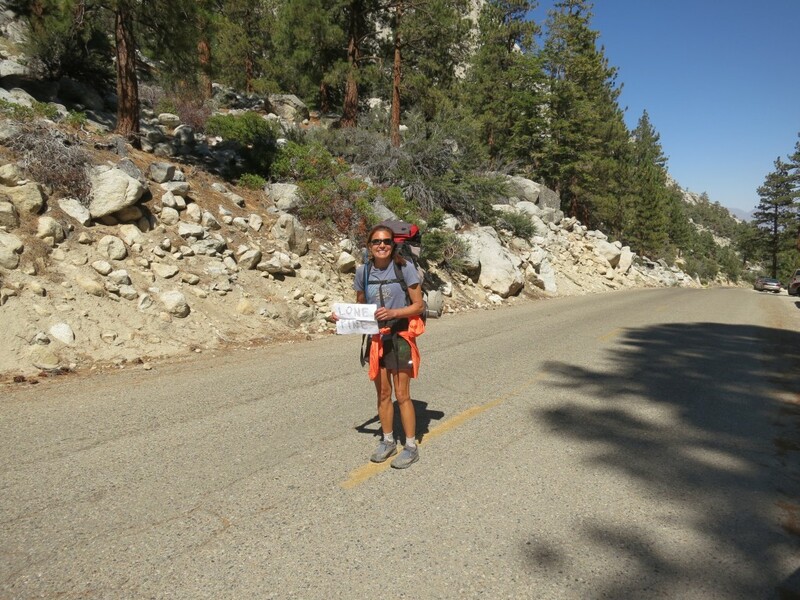 This entry was posted in JMT Trip on September 3, 2014 by admin.